The 19th South Korean presidential election was held on 9 May 2017. The election was called after the impeachment and dismissal of President Park Geun-hye. The election was held in a single round on a first-past-the-post basis. The election was originally scheduled to be held on 20 December 2017, but was moved earlier after the decision of the Constitutional Court on 10 March 2017 to uphold the parliament's impeachment of Park Geun-hye. 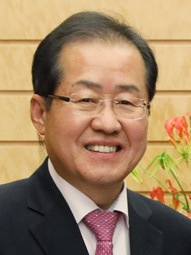 Opinion polling before April showed the Democratic Party's candidate, Moon Jae-in, runner-up in the 2012 election, as the front-runner and would later go on to win the election. ↑ McCurry, Justin (9 March 2017). "South Korean president Park Geun-hye forced from office by constitutional court". The Guardian. Retrieved 10 March 2017. ↑ "황교안 대선 불출마 선언" (in Korean). Kyunghyang Shinmun. 15 March 2017. Retrieved 15 March 2017. ↑ "PM not to run for presidency". koreatimes. 2017-03-15. Retrieved 2017-05-17. ↑ Sang-hun, Choe (2017-03-15). "South Korea to Elect New President in May, Government Says". The New York Times. ISSN 0362-4331. Retrieved 2017-05-17. This page was last changed on 23 July 2018, at 06:45.